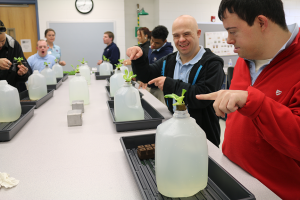 Last week, a group of Down syndrome students attended a hydroponics workshop with Extension agents at MREC. The group of 10 students learned the basics of hydroponic systems through hands-on activities led by Hannah Wooten, Seminole County Extension agent, and Dr. Liz Felter, regional specialized Extension agent. Topics included how the system works, materials, plant health and hydroponic maintenance. Students spent their morning learning how to work with plants and how hydroponics differs from growing traditional potted plants. Extension agents worked with Morning Star Catholic School, a not-for-profit organization for special needs students. The workshop was part of the school’s transition program, which provides learning opportunities for its students to embrace their potential and learn life skills. For more information about Morning Star Catholic School, follow this link. For more information about the Seminole and Orange County Extension offices, follow this link.